Through out this 10 years of your life with us, you have shown tremendously unbelievable talents that we as parents couldn't even thought that our children would have! As our first born, you developed skills faster than your age and you love to explore new things or do it yourself to show what you can do. 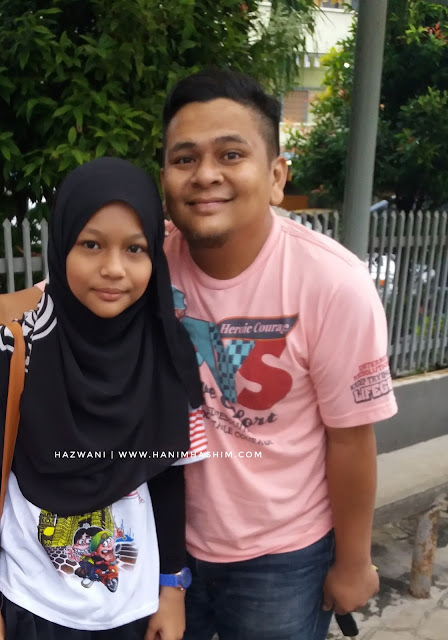 I still remember your darjah 3 class teacher, Mr. Raj said to me during the Report Card Day in the Dewan Zamrud, "Hazwani ... dia sangat cepat dalam kelas. Homework dia dah siap tapi murid lain belum lagi. Dia siap request kat saya ada lagi homework tak sir, saya boring la", and we both burst into laugh. Can't believe you actually said that hahaha! Yes... you get bored easily especially when you are done with something while others still not. That's why your teacher had to give extra homework to keep you busy in the class. I remember when you came home and complained to me that there's a girl in your class who could'nt keep up in mengaji. You and your friends had finished the page while she still on the same page and ustazah will not turn to the new one until everyone has finished. So you said it was boring to wait for her. But I said that you must give her time and teach her so that she could catch up with you guys. We never leave friends behind ok. Speaking of the topic, there's something in you that always amazes me and your father. Everytime you built/drew/wrote something, you'd come to us and show your work of art and we'd like ... wowwww! That is so beautiful sayang! Then, recently you showed us something that you made yourself. First of all, drawing is one of the skills that we (me and your father) didn't really enjoy during our childhood ... hahaha! Just to be true, I hate drawings. I hate it because I'm not good at it, especially when it comes to drawing human. I used to draw orang lidi for Pendidikan Seni and I hated it lol. So, as I wasn't into drawings since school-hood, I found it quite difficult to teach you and your little sister when it comes to homework. But we never discourage our children, and if you are really good at it, we as parents will be so proud than ever! I read somewhere that drawing is a therapy, it gives you the calmness and you become more focus. 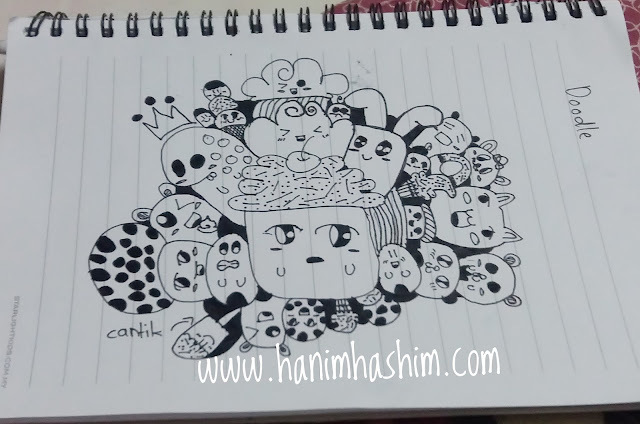 You are in your own world and whatever you draw represent your feelings. And yesterday at the Popular bookshop you saw this pen and said it is for drawing doodles. The price for one is RM2.40 and your father got one for each. Your sister was thrilled with the pen though she hasn't started her first doodle hahaha. When I asked her where is your doodle? She said, she wasn't ready yet! lol. 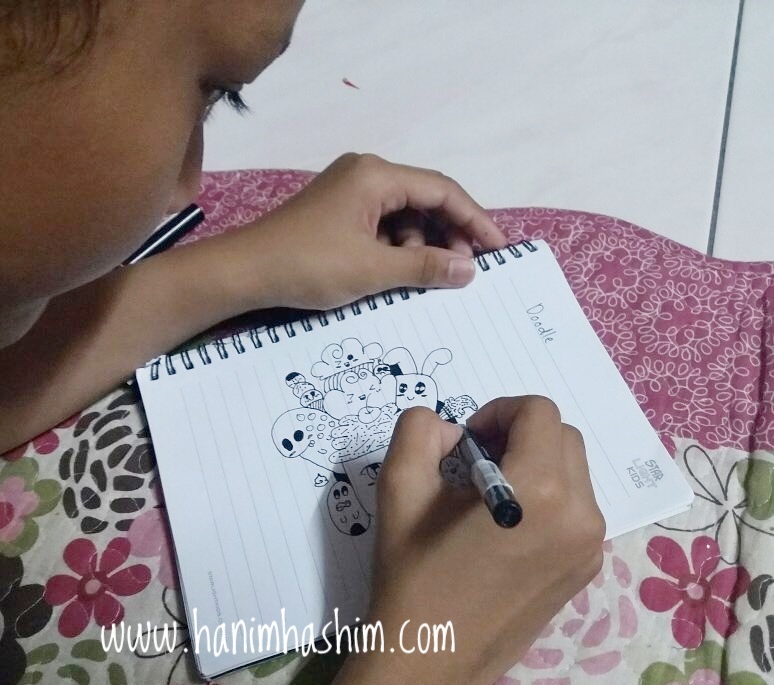 Later at night, you started to pour your doodling ideas on a piece of paper while your sister playing with her toys on the desk. Me, I was in other room watching your father working with his diecast cars. And suddenly, you came and show us your first doodle (above). This is beautiful! I can never do this myself! You said some of the character you took from the Google and some of it is your idea. And yes, you have something we don't ... that is finger of art (jari berseni). Again and again, you have made us proud sayang! You keep suprising me in a special way and I hope it continues. May Allah give you excellent health, good life and peace of mind sayang.